Five-inch random orbit sanders are probably the most popular woodworking sander on the market today. These sanders typically have swirl-less patterns to avoid scratching, dust collection to keep sawdust off of the stock, and easy hook-and-loop fasteners for connecting the ​disks to the sander's pad. The sanding disks all have a standard hole pattern to help with the dust collection. Some features to consider when buying a random orbit sander are the quality of the dust collection system, whether it is a canister or a bag, and whether the dust port can be connected easily to a shop vacuum or dust collector. Your choice in sander should probably include a lengthy power cord and shouldn't be overly noisy or one that vibrates extensively, which can increase user fatigue on big sanding jobs. Bosch engineers recently took to the drawing board to redesign the Bosch ROS20VSK Random Orbit Sander, and the improvements are apparent. 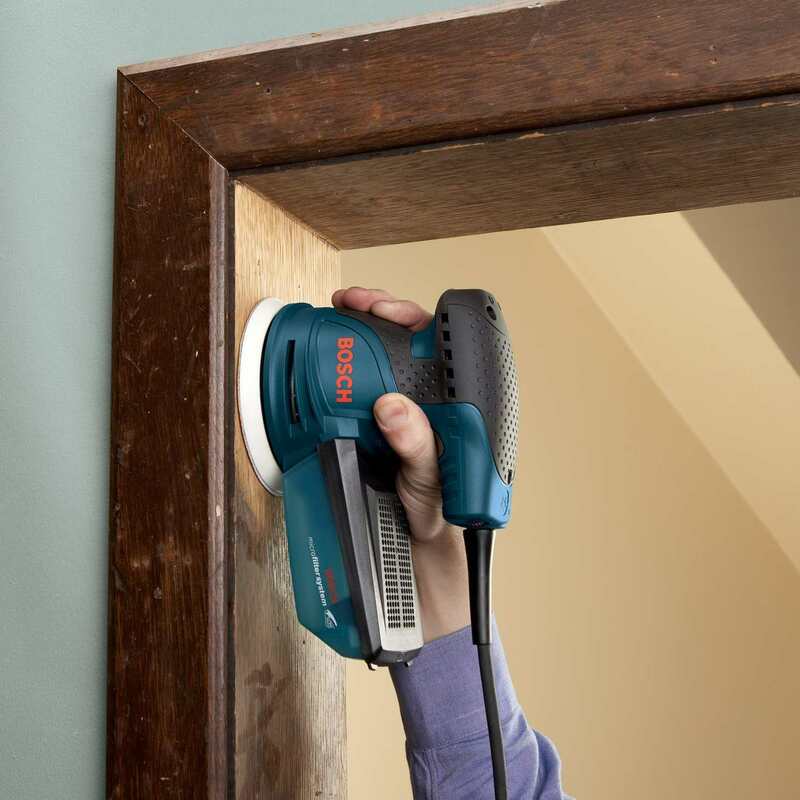 With a 2.5-amp variable speed (7,500-12,000 RPM) motor, the sander provides a very smooth, even finish without a lot of vibration to be transferred to the user. Less vibration means less fatigue, so you can use the sander longer. It is comparatively quiet, with a micro-filter dust collector that does a great job if you don't want to connect the sander to a dust collection system. The DeWalt D26453 Random Orbit Sander is a feature-packed 5-inch sander that employs a 3-amp variable-speed motor, offering speeds from 7000-12000 RPM. The DeWalt C26453 includes a hard-shell case and is covered by a three-year manufacturer's warranty. As with most units in this category, it includes a dust-sealed switch and dust bag (or the ability to connect to a dust-collection hose). The Hitachi SV13YA Random Orbit Sander is powered by a variable-speed 2.4-amp (230-watt) motor (with speeds from 7,000 to 12,000 RPM). This sander uses 5-inch (8-hole) hook and loop sanding disks, has a sealed slide on/off switch, dust bag, and hard-shell carrying case. Perhaps the most appealing feature is that the Hitachi SV13YA is covered by a 5-year warranty. Also covered by a five-year warranty, the Milwaukee 6021-21 Random Orbit Sander is a great value for a sander. While the sander uses standard 5-inch sanding discs and is powered by a 3-amp variable speed motor, the sander's comfortable ergonomic grip and electronic soft start set it apart from other models in its class. The Porter-Cable 343VSK Random Orbit Sander also utilizes a 3-amp variable speed (7,000-12,000 RPM) motor to power 5-inch sanding discs. This unit is one of the more aggressive sanders in the class, which means that while it sands very quickly, you'll need to keep a firmer grip to keep the sander going in the preferred direction than other sanders. Dust collection is handled by either a dust canister or by connecting a 1-inch or 1-1/2 inch vacuum hose.